Last week we discussed bearing the burdens of others and even caring for their belongings when we find them. The Old Testament teaches us to love our neighbors as ourselves, to love them as God loves them, to care for them and their needs as God cares for us. Our test is to turn all these things over to God and even care for those whom we know are at angst with us. We receive great blessings when we obey God, especially in times of strife. We noted that we can have great blessings of the Lord when we concentrate on giving others hope and the love of Christ. We saw not only a way to share the love of Christ, but we saw that Christ’s commandment to love our neighbor as ourselves was not as new as many think. Our test is: Would we put ourselves out for one another even when we do not think it would be appreciated? Would we do all we can even for those that hate us? Would we take steps to serve another we know does not like us and is even out to hurt us? It is easy to love those who love you. It should be just as easy to love those who do not love you because of Christ within us. Today we talk about tests of dedication. When we open to our passage we find how deeply our Lord loves children, but we find much, much more. What we see here is how deep a faith we should display in our great and glorious redeemer, Jesus Christ. Though we will focus on the passage in Matthew 18:4, we will also look at two other passages in Genesis for perspective. We will open by considering Psalm 19, though, the passage we read in our scripture reading. We will consider this passage before our main passage as a way to orient our mindset toward the One to whom we are humbling and dedicating our selves. Understanding His greatness is vital to our perspective. I have some pictures here from the Hubble Space Telescope. [i] None of the images you will see are actually visible with the naked eye. There is filtering on the telescope to get the images you see in some cases. In other instances, they are just too far away. Some of the spectacular things are the gases in the regions that you find depicted. They are illuminated by the starlight around them, and the light God created in Genesis 1:3. We serve the God that did all this. This is simply amazing. The span of space between the stars alone in these pictures is hundreds of light-years. The span across the whole picture could be in the millions of light-years. Some of what you see depicted are pictures of stars that have exploded in recent history. When I think of the great majesty of God, I think of these things. I think of the same complexity that He built into a single cell. I think of how small man is in this great expanse of the heavens and that we are not even able to see most of God’s creation (Deut 29:29). This is God’s personal art gallery. God made much for us to see. By His grace, we are able to see more of it. By His power, He sustains all things with a thought while we marvel at the creation. Where we can only see such great expansive beauty, He can visit each star in His creation. Where we can only fathom of travel to a distant planet to study it, He can walk upon its face regardless of the atmosphere there. God needs no space suit, no space shuttle and He certainly does not need to be put to sleep for any long journey. God is omnipresent. He is as much there on any star or planet you choose to point to as He is here right now. Ladies and gentlemen, that is the magnitude of our God. He is truly unfathomable. We cannot comprehend all that He is. There are a number of reasons for this, but the most significant reason is because we cannot even comprehend all that He has done. If we cannot understand all that He has done, we can never truly understand or limit all that He will do either. Our God is magnificent, glorious and terribly powerful. When we think of ourselves as children of God, we must put all this into some perspective. One perspective we have a picture of is in our scripture today. Let’s consider our tests of dedication with respect to our position as children of this awe-inspiring and perfectly loving God. Consider Noah. Consider some facts that surround his life. He had lived for 500 years before God called upon him to build the ark. He had three sons after that 500-year mark (Gen 5:32). We know they grew to adulthood and took wives before God contacted Noah. We can estimate then that it took him in the neighborhood of 70 to 80 years to build the ark because in Genesis 7:6 we find he was 600 years old when he entered the Ark with all the animals. [ii] We know that in Genesis 6 God tells Noah specifically what kind of ship to build, what to build it out of, and what to do to build it. God promises Noah He will make a covenant with him. The sign of this is the rainbow we find later in scripture with a promise never again to flood the Earth. We know that Noah preached righteousness even though the people did not listen. Noah was dedicated to the Father of lights. Noah was wholly faithful, believing God would provide all that was needed for his task. Noah rested in God’s truth and obeyed Him completely even when all those around him mocked him and were nothing but wicked (Heb 11:7). At 500 years old, Noah was dedicated to God as a child is to his father. Noah wanted no part of disappointing God and employed his sons for equal support. Noah led his whole family through his faith. We should note that throughout scripture we find no description of the righteousness of Shem, Ham or Japheth. However, through their dedication to their father Noah, they are saved as well. Noah is the individual seen as righteous. Noah obeyed all that God had him do. Noah’s pure dedication and love for God through the trials of disbelieve in all those around him proved God was good and true to His word. No one listened when Noah preached. Not one individual believed him. Other than their compliance to help build the ark, there is no indication that his family was sold on the whole idea that God would destroy the Earth with rain, either. He preached righteousness and brought destruction down upon every ungodly individual in the world. Can we stand in the face of such ridicule and remain dedicated to God? We should be mindful that Noah saw God’s great power. He believed God could and would do what He said. There is no indication that Noah balked at what God instructed him to do. Scripture only testifies that Noah did everything in submission to God with strict obedience to His command. Noah was dedicated just as any child of God that sees His great power should be. We do not see many grand demonstrations of God’s direct power today. We hear stories, but we do not see God moving mountains literally. We hear stories but we do not see great pillars of flame such as the one that protected the Israelites at the Red Sea. We do not see the Red Sea being divided for us to walk to safety. Do not mourn in your heart, or let yourself become weary, Christian. A miracle of a far greater magnitude happens every time a soul is saved and assured of a place in Heaven! Every soul God saves is saved from the next destruction. Every soul God saves is delivered from the preaching of righteous damnation to the preaching of sanctification. Every soul saved moves from a position of condemnation to a position of justified righteousness before God. Unlike the creation, each soul saved has a will and must subordinate that will to God for salvation. 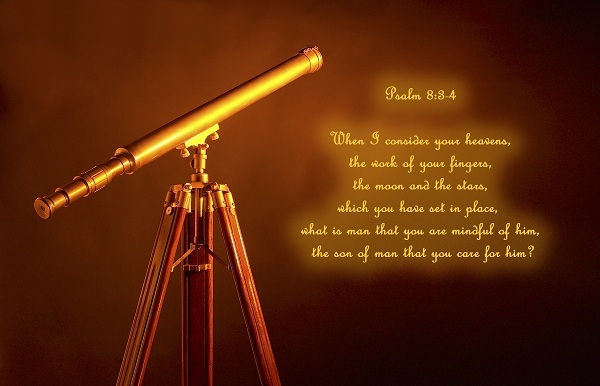 Beloved Christian, if we see the great expanses of heavenly bodies in the lens of a man made telescope that spans incredible and incomprehensible distances, we also see a God of incalculable magnitude that loves us with all that power. Noah knew this power without seeing what you have seen today. Noah believed in that power without having seen the modern wonders of science. Noah knew it, rested in it, laid his life in the hands of his faith and for almost 100 years worked on something that seemingly had no purpose. The Person who created this magnificent universe and all the things in it reached down to this little planet, and placed His Son in the womb of a woman for our salvation. We marvel at Abraham’s faith, but we too can have that sure a faith. We can know God will provide when we are in His will. We can know God will give us what He wants us to have and much, much more. We can live without fear. We can live in determined faith just as Abraham did as he left the Ur of Chaldees and all his worldly security behind. We can live dedicated to God knowing His promises will be fulfilled. We may have challenges trying to implement what He promises. Sarah was barren and God took many years to tell them that she would bear the child, Isaac. Still, we walk upright and sure of our path knowing God has promised to glorify Himself through us. We should not make the same mistake Abraham made and sin in the process of trying to fulfill His will. We should have every confidence in God and be wholly dedicated to fulfilling His will. We saw God’s art room earlier. Abraham knew God could do that. Though he had never seen any of the beauty you have now witnessed. He knew God’s power. He had been preserved; his flocks and families had been preserved. He had met the travelers that destroyed Sodom. He knew their power as Sodom was incinerated. Abraham had many other reasons to be completely dedicated to God. Then Sarah bore Isaac. God had finally fulfilled his promise. Abraham knew God would provide for His promise. God promised Abraham many kindred and nations from his loins. Abraham’s faith and dedication to God was counted unto him for righteousness (Rom 4:3, 9). All God’s promises to Abraham were realized in Isaac (Rom 9:7). Still, he offered Isaac on the altar as God commanded, with full faith in God’s ability to provide a sacrifice or resurrect Isaac to fulfill the promise (Gen 22:8; Heb 11:17). Just as with Abraham, God may test us right to the very end. He is faithful and will provide. We must stay dedicated to the fulfillment of God’s will. We seek the power only God can provide. He gave power to Abraham; He can give power to us too. Romans 4:20 tells us he did not stagger or stumble at all about the promise of God. There was no unbelief in him. Abraham was strong in faith and gave all the glory to God. We will soon celebrate the resurrection of Jesus the Christ. When we do, I ask that you remember the greatness you have seen today and consider the miracle of life. I pray you realize that with us new life is a glory. In God’s universe, some of the greatest beauty comes from heavenly bodies that die. Our bodies are more complex than any single star system out there. Consider the promises of God in your salvation. To God you are more beautiful even than one of these galactic beauties. Looking at Matthew 18:4, we find a very dramatic description of the faith we should have in Christ. We have to believe as children believe. Children know no different than those adult figures around them. Children know no caretaker other than those that put food before them, clothe them, encourage them or correct them. There are great negative examples in our world today, including such as parents that do not care for their children at all. However, those children can still identify with their parents and openly do so. It is not until they are older that they begin to separate from their parents. When they begin to fend for themselves, their independence takes over. Even children in good homes have to fight themselves to submit to their parents. The reasons for this are many but they boil down to one question: Who do we think knows better? We have the most perfect Father in the universe. When I look at His galactic art gallery, our little slideshow that opened our message today, I wonder at His greatness. His wisdom, intellect and all His other characteristics and aptitudes which are equally awesome. He knows everything about everything. God knows how to make a star explode to look like an hourglass. God knows how to illuminate a galaxy of a million stars to look like the clouds in the sky. He shapes and forms that galactic dust as a master painter uses his brush to paint a canvas. We wonder where men such as da Vinci, Picasso, van Gogh, Michelangelo and Rembrandt learned and received their talent. Consider God’s works. Paintings, sculptures and all the fine art forms are displayed in His creation. Beloved, Jesus is speaking to adults in this verse. He is saying we should marvel at and be as dedicated to our heavenly Father as much as these children marvel at and are dedicated to their earthly fathers. Sons normally want to be like their fathers. Daughters relish time with her fathers and to be like their mother. Even youngsters with bad parental examples seek to find what they consider are the best attributes to emulate in their parents. If we have the most perfect Father in the universe, there are no attributes we should not emulate. We should be even more dedicated to Him and the furtherance of His kingdom than any child of the world. I see the child gathered at the legs of a father, cowering from the oppression of the world. I see a child humbled by their small stature and clinging to the only greatness they know, however feeble it may be as they stand holding tight to their father’s leg. This is the picture of dedication and humility. We too should run to the Father pull at His tunic and cling to His leg as a child does when faced with danger or challenge. Our Father may pull us away and point to the danger and direct us to resolve it on our own. He may stand firm and defend us against the danger. Our Father will defeat any danger that may hurt us. We humble and dedicate ourselves to His power to do all these things. We have to humble and dedicate ourselves to His decisions for all of these things. Humble yourselves as a little child before God. Today we have seen some of God’s great and glorious power. The heavens do declare His majesty like nothing else. Noah and Abraham submitted to His will and His promises before all else, including their own families and tribesman. They led in the face of blatant rebellion and worldly opposition. These two men and many others have defied the things of the world in their dedication to a great and glorious God. We should do no less. Run from the worldly things and cling to the Lord’s cloak. Run from any evil that presents itself and grasp the leg of your heavenly Father. Seek His protection. Do not stand boldly and defiantly before the world thinking that you are capable of handling anything it could throw at you. That may be the way of the west, but it is not the way of God. The admonition is to come and humble yourself as a child. Be dedicated to God’s Kingdom. Forsake the kingdom of your heart. If we can submit wholly to His will and His decisions, promoting only the furtherance of His Kingdom, He will grow us and we will grow in Him. If we stay steeped in our own wisdom, we will never advance His Kingdom. We have a choice to be dedicated to His kingdom or to our wisdom. We are invited to humble ourselves before Him as a child. Brothers and sisters in Christ, the furtherance of His kingdom on this earth operates through faith and faith alone. Without our humble faith in Him, His use of us to further His kingdom becomes antagonistic (Rom 14:23). There is no indication that Noah received constant and intimate instruction after his initial encounter with God. He did all that God commanded. God only gave Abraham certain pieces of illumination at specific times. We do not know why, but we know that Abraham acted on each on faithfully and went forward to carry out all His commands. Each of these men acted as a child follows direction from their parents and we all know they are not isolated in scripture. There are many examples of child like faith following the Father of fathers in the face of great adversity. Be dedicated to God and His kingdom. Humble yourselves as children such that you do not know and do not claim to know what God would or would not want for you, or for our church. Our humility and faithful submission develops dedication as we invest more and more of ourselves into our home. That is not a reference to money. We dedicate our whole hearts into our God and let Him change them for His glory. That is the test. [ii] Before this, some of the earliest marriages we found in scripture were with men of 30 years or older. Noah may have only spent 60-70 years building the ark.